When it comes to HDMI™, higher speed means higher performance. So make sure to invest in a true high-speed HDMI cable like the Monster 700HD, for all the vivid color, immersive sound and excitement you expect from your high definition home theater. With a cable bandwidth of greater than 10.2 Gbps, you'll know you're maximizing the performance of your 1080p HDTV, DVD player, including Blu-ray Disc™/HD DVD™ players and HD cable/satellite receiver. Even next-gen gaming consoles like PlayStation® 3 and Xbox 360™. Featuring exclusive connector technologies and precision-wound conductors, 700HD maximizes digital signal transfer. The payoff: a breathtaking picture, free of common cable-induced artifacts, such as streaks and flashing pixels. Step up to 700HD and experience a level of high definition that’s beyond expectations. If you ever the need Ethernet over HDMI functionality, Monster will upgrade your cable. Your Monster Advanced cable for HDMI is covered by the Monsters Live Forever Full Lifetime Warranty -- the best warranty in the business. See packaging for full details. 4.754 (4 Reviews) 100% of reviewers would recommend this product to a friend. The full manufacturer's warranty from Monster is only valid when the Monster MC 700HD HDMI High Speed HDMI Cable is purchased from an Internet Authorized Dealer. 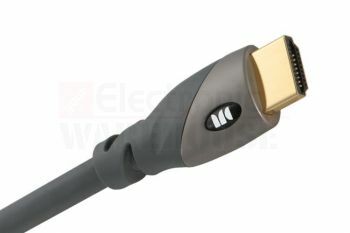 We will match any Internet Authorized Dealer's best price on the Monster MC 700HD HDMI High Speed HDMI Cable.